Mike Moore | The Journal Gazette Shawn Szydlowski, who was the ECHL’s leading scorer and MVP, will play in Norway this season. 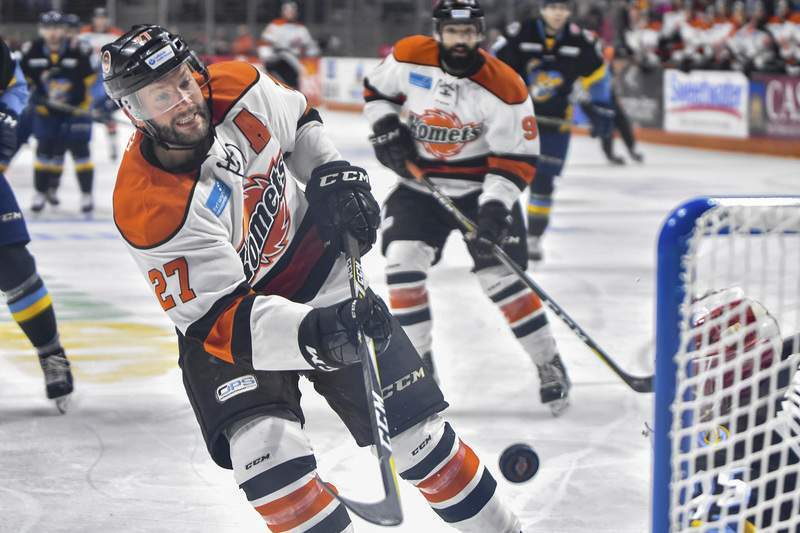 I asked Shawn Szydlowski about the possibility of returning to the Komets, as so many players in this type of situation before have, and he said it was a possibility. And if he doesn’t get a chance to don the uniform again, Szydlowski said he’ll always be a Komet regardless. Szydlowski, who will play in Norway, said the decision was a financial one and because this was a team that made him feel comfortable and that he would be valued. He stressed the Komets did nothing wrong; ECHL teams just can't, because of the rules, match these types of offers. “I wouldn’t have any regrets going overseas if we’d won the Kelly Cup this year. It’s a little tough knowing we didn’t do that. But I think it’s just that time in my career now,” said Szydlowski, 27, who’d spent five seasons with Fort Wayne. I've been told Curtis Leonard will also be going overseas. In more positive news, I've been told by reliable sources the Komets have talked with two NHL teams about affiliating: The Vegas Golden Knights and the Nashville Predators. I don't know what the chances of either are, but they have spoken.